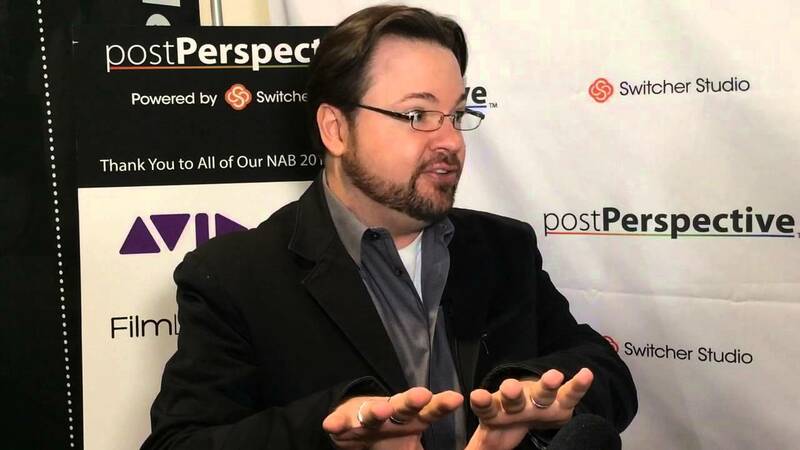 Michael Kammes is a regular on the Digital Production Buzz, but has been attending the NAB show for many years. Tonight he joins us to talk about interesting and progressive technologies he saw at 2017’s NAB Show. Larry Jordan: In his current role as the director of technology at Key Code Media, Michael Kammes consults on the latest in technology, and best practices with digital media. He’s also, well he has this strange love of workflows which we forgive him for. Hello Michael, how are you? Michael Kammes: I’m great. It’s fantastic to hear the smooth dulcet sounds of Larry Jordan. Larry Jordan: Yes, well it’s nice that the smooth dulcet tones of Larry Jordan don’t have a cold. I thought I was going to die at NAB and I managed to survive because now, I get to talk to you. What were the highlights of the show? Michael Kammes: Cloud this, cloud that. Everything was cloud in south hall, lower and upper. Everyone was interopping with Microsoft, everyone was interopping with Amazon, and leveraging the AI, the intelligence that these cloud providers have to bolster the feature set of the solutions that the manufacturers in south hall lower and upper were pushing. Larry Jordan: What do you mean by AI? Larry Jordan: Well one of the things Ned mentioned is that he didn’t see a whole lot of hardware announcements, but did see a lot of workflow, and much more attention being paid to what we’re using the hardware to create. You notice anything? Michael Kammes: Completely. I think, for years it’s been moving away from custom hardware to generic hardware with custom software. But one thing Ned did mention that I think we’re a little farther along than he may have made it seem, would be video over IP. If we look at Grass Valley, at Ross, at NewTec, they’re all developing, or have developed, standards of transmitting video over IP instead of traditional SDI cables. So we’re a lot farther along than just starting to look at it. Larry Jordan: Have they unified around the single standard, or do we have the NewTec standard and a Grass Valley standard? Michael Kammes: There’s a lot of different standards, just like HDR and unfortunately SMPTE haven’t finalized their recommendations, and then you have companies like NewTec pushing their own. So there really isn’t one standard right now unfortunately. Larry Jordan: Last year, I almost bought a helicopter. Larry Jordan: Yeah, well I didn’t have the money and I have no place to park it, but it had my name on it. So what did you see that caught your eye at the show? Michael Kammes: Well speaking of automobiles, actually I saw one off the show floor. Lucas Wilson of Supersphere Productions has a partnership with a 2D production broadcast truck. All outfitted with Blackmagic gear, but what they also do, is shoot 360 and in that 360 broadcast, they superimpose the 2D images. So if you’re watching a sporting event or a concert, you can have a heads up display almost with stats or facts or other camera angles without taking you out of the 360 experience. Larry Jordan: Alright, I’ll get my helicopter, you get your 360 production truck. Did you sense an overall theme at the show? Michael Kammes: No, I found that more people, as has been mentioned before, wanted to get news out ahead of time because they realized that they’ll get lost in the white noise. So I saw a lot of people pushing to get their word out prior to try and garner that kind of press before NAB. Larry Jordan: So, what was your feeling, big show or sort of an off year show? Michael Kammes: The statistics I read said that we had 103,000 people I think, and 1900 exhibitors. But the key word that I saw was registered. It didn’t say how many actually showed up. So, it seemed a little bit lighter this year, but the numbers say registered were more. Larry Jordan: NAB was saying 106,000 the last day of the show. That was the number they published, so that’s the number that I take away with. Michael, for people that want more information, where can they go on the web? Michael Kammes: Two places, you can go to michaelkammes.com and my web series on technology fivethingsseries.com. Larry Jordan: That’s all one word, michaelkammes.com and Michael himself is the voice you’re listening to. Michael thanks so much for your time. Michael Kammes: My pleasure Larry, thank you.